Recent technological advancements, especially in UV LED technology, have opened a new frontier for applications that harness the power of UV light. However, light often needs to be filtered and controlled to gain desired performance results. Our UV filter glasses have been designed to meet common industry requirements; but we also have the capability to customize glass compositions for emerging technologies and applications. Our UV bandpass filters are engineered to exhibit high transmittance in the UV-A, UV-B, or UV-C regions. These filters appear nearly black as they absorb almost all visible radiation but actually provide high transmission in the UV wavelengths of light. Our filters are engineered to have high transmission at common application wavelengths including at 254 nm and 365nm. They are suitable for a wide variety of applications, such as non-destructive testing (NDT) equipment, sensing, bioimaging and illumination, tanning and phototherapy devices, forensic detection and analysis equipment, and theatrical lighting. Available in two formats, our filter glass can be supplied either as unfinished 6”-6.5” square blanks or as molded glass. Learn more about our unique capability to mold filter glass. Our UV filter glasses are often preferred for harsh, demanding applications due to their superior durability and resistance to abrasion, chemical corrosion, and thermal shock. We can heat strengthen our UV filter glass to further improve mechanical durability and thermal shock resistance. Need more information? 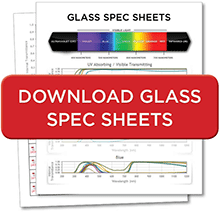 Download the complete spectral datasheets for our UV bandpass filters.